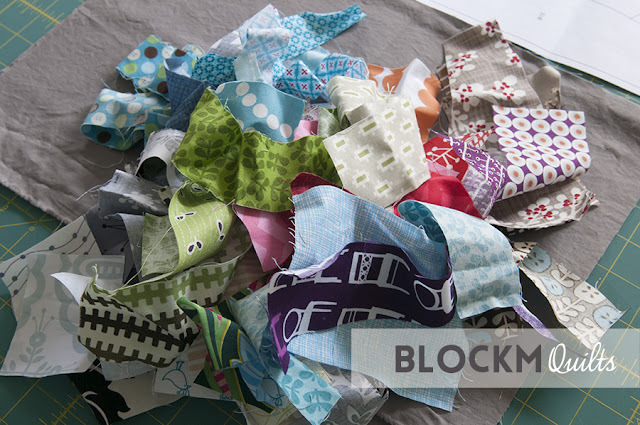 block M quilts: I have started a quilting bee! I have started a quilting bee! 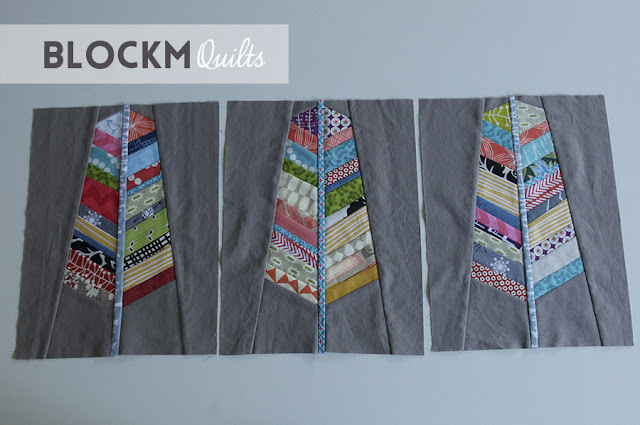 I am super excited to let you know that I have started a quilting bee! 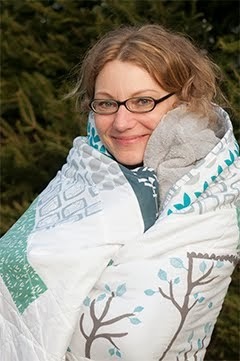 I was looking for modern quilters in Germany who are not involved in a bee already and found some super nice ladies! Yes, you counted correctly we are only six members but that is exactly what we wanted. We have two months time to complete the blocks for the queen bee and we also pause for the months of November and December. 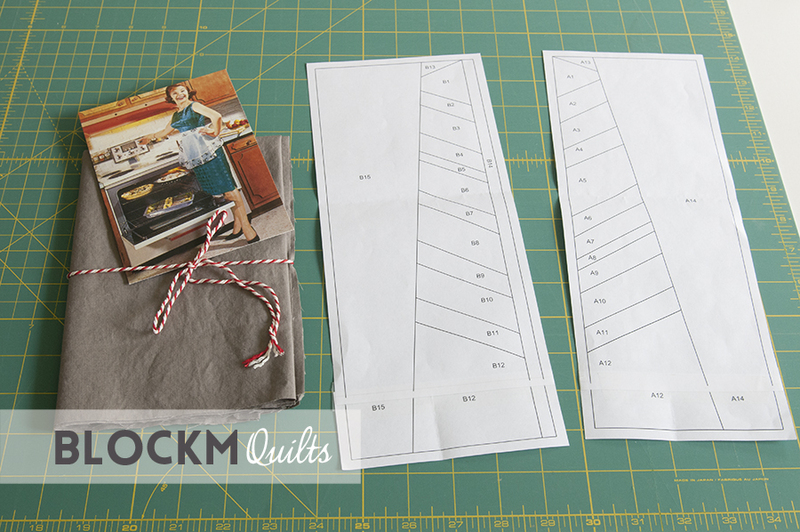 We also sew with our own fabrics and only send finished blocks around. Stress free. Claudia was the first queen bee for the months September/ October and requested paper pieced feather blocks. She did sent us some backgroud fabrics (yes, we make exceptions as well) and a lovely post card which I used to fold the paper. Great! This was the first time I ever done paper piecing. I was happy that I could play with my scraps again. Luckily the background fabrics matched perfectly with any of my scraps. I have to say that the paper piecing did come with some challenges for me, I don't know how often I ripped out seams of the first block... sewn in 1.5 mm... no fun! But I really liked how it turned out. The tutorial for the block is by Blossom Heart Quilt. The second block was better, but again I had to use my seam ripper - a lot. Then I was all ambitious to do one block without ripping out seams and this time is almost worked perfectly. I had oddly shaped scraps and that made the piecing in diagonal lines of the feather somehow difficult. All in all I'm happy how they turned out and I hope Claudia will as well. As mentioned before we pause for the next two months but it's actually my turn in January/ February. I am really happy to be involved in this bee and I'm looking forward to some exciting blocks and quilts! Linking this to Scraptastic Tuesday and Finish up Friday at Crazy Mom Quilts and WIP Wednesday at Freshly Pieced! I was really looking for some like minded, crazy quilters because sewing all by yourself all the time is no fun. I'm very happy to be involved in our little quilty adventure! Your blocks look beautiful - well done and good luck with your exciting new quilting bee. Thank you so much! I like the blocks too, I guess my next PP project will be a lot better from the start. Yay, thanks Sarah! I'm so happy to have found these wonderful ladies! Hihi, know that feeling - wonky scraps or angles in paper piecing make my head hurt, too. I had to use the seamripper as well in my first feather -- will leave now to sew the next one. I'm having so much fun already! I see that you're now involved in a local MQG, that's great! Neat! You all have fun! QuiP# 6 - I can't really tell what it is yet! !